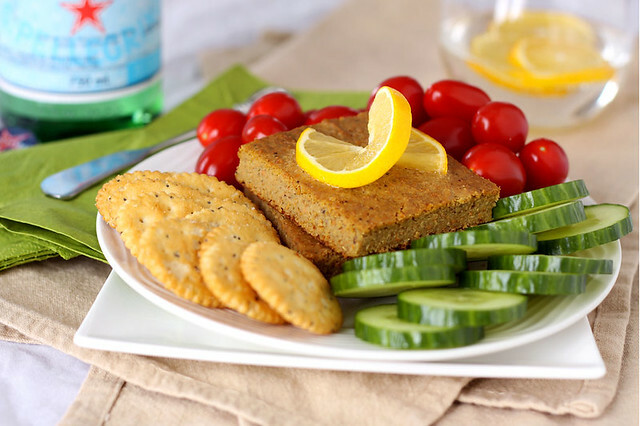 The first time I had veggie pâté, I was still at University, visiting one of my aunts. Come to think of it, that's almost 20 years ago... Man, time does fly, doesn't it?! Anywho, my aunt was on a health kick at the time and she was experimenting with all sorts of vegetarian dishes such as seitan pie, quinoa soup, all sorts of millet recipes and of course, veggie pâté. She didn't make the pâté herself though, she bought a brand that originated in the restaurants Commensal. I mention this because, it is the only brand I actually like but it is quite expensive. At the time, I didn't even think making veggie pâté at home was possible, so I just kept buying the pre-made kind. But once I found recipes for it, I decided to try making some myself. Of course, my recently acquired food processor made the experience a whole lot easier. The recipe I'm posting here today, is the one that comes closest to the Commensal recipe, in my opinion. The texture, when blended in the food processor, is almost as smooth and the taste is very similar. I think that's because of the sunflower seeds and nutritional yeast. The other recipes I tried didn't contain those ingredients and I always felt like they were missing something. This one... This one is perfect! It's even better than the store bought kind because, really, it's fresher and endlessly adaptable. You can use whatever blend of spices you like, add more or less nutritional yeast, try different veggie combinations, etc. My kids love it with crackers or even in sandwiches. Seriously, my oldest daughter and my son love the stuff! And, I know this makes a large amount of pâté but it keeps in the refrigerator for a week or so and you can freeze some for those times when you just don't feel like taking out the food processor. Adapted from Végétariens... mais pas légumes! This recipe is a lot quicker to make if you have a food processor, all that grating and grinding, but you can still make it if you don't have one. The texture of the pâté will be a bit chunkier but the taste will be pretty much the same. *Once grated, you should have about 560g of veggies, total. A little bit more or less won't matter though. Preheat your oven to 350 degrees F. Lightly oil an 8 x 11.5 inch baking dish and set aside. At this point, you can just mix all the ingredients together and you will get a chunky pâté, which is fine. But I like it to have a smoother texture, so what I do is, once I've grated all my veggies in the food processor, I place the veggies in a bowl, remove the grating disc and put the all-purpose blade in its place. Then, I put all the ingredients back into the food processor and I let it whir for a good 5 minutes. I like the texture better and I think the flavors all meld together perfectly. It's a question of taste, really. Once your mixture is ready, pour it into the prepared dish and bake in the center of the oven for about 1 hour. The pâté will be golden and completely set in the middle. Let the pâté cool in the dish before unmolding it; it will be fragile while still warm. The pâté is best served at room temperature, with crackers and veggies or used as a sandwich base with lettuce, tomatoes, avocados, etc. I love veggie pate! I can't wait to try this. One question: would "nutritional yeast" be something like Marmite? i can't even say how much more appealing this is than the traditional pate. lovely recipe and images! I've made different veggie paté recipes. The last one I tried and like a lot was from Ricardo. I had the cookbook Végétariens...mais pas légumes and can't seem to find it for your recipe. Looks yummy! I never had a veggie pate but I want one now! I can't stand any kind of meat pate but this I would definitely like to try! And I love nutritional yeast - I can spoon it up. Is the potato raw? Do you cook it? All the ingredients are raw before blending in the food processor. tasty basmati rice dish that is easy to cook using Pure Basmati rice, which enhances and complements the fragrant flavours of any rice dish. Put your heart, mind, and soul into even your smallest acts. This is the secret of success. See the link below for more info.